" Curator of fish at the Museum of Zoology at the University of Michigan for 24 years "
Carl Leavitt Hubbs (October 19, 1894 – June 30, 1979) was an American ichthyologist. From 1917 until 1920 Hubbs served as the assistant curator of fish, amphibians and reptiles at the Field Museum of Natural History in Chicago. He married Laura Cornelia Clark on June 15, 1918, with whom he would have three children. His wife, who had also studied at Stanford, having received her BA in 1915 and her Masters in 1916, taught math. In 1920, he took the position of curator of fish at the Museum of Zoology at the University of Michigan, a position he held for 24 years. 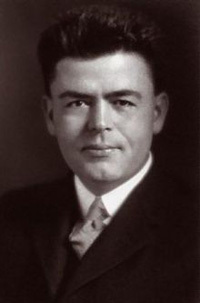 In 1927, while working at the University of Michigan, he received his Ph.D., writing his dissertation on The Consequences of Structural Modifications of the Developmental Rate in Fishes Considered in Reference to Certain Problems of Evolution. Hubbs himself along with members of team and students contributed to the enrichment of the museum's collection. In 1929, he participated in an academic trip to Java where he collected five tons of specimens. Hubbs began to study hybridization among different species of fish.